How to be green – don’t save the Panda? A bit controversial this one and I am not sure what I think about the suggestion but I thought I would share it. An article from Bloomberg suggests that we shouldn’t be prolonging the inevitable demise of the Panda and that Darwinism isn’t for crybabies. But maybe Oscar Wilde was right. “The first test of a species’ worthiness for conservation should be some instinct for self-preservation. And pandas fail objectively” ummm ok and can see where they are coming from. “Although blessed with a bear’s predatory teeth, the lethargic beasts eat almost nothing but bamboo — a plant that’s nearly devoid of nutritional value and disappearing in the wild. Pandas consume 40 pounds of it a day, eating constantly, speeding their own demise.” OK, so bamboo is declining in the wild and Panda’s eat a lot of it but that’s not a reason to not save them. So I can see where the author is coming from and certainly if you did an ecological footprint calculation of the cradle to grave of an average Panda in captivity then it would be huge compared to conserving other species. But is that a reason to let them perish? Does the price outweigh the value? How do we assign value on animals, nature, people to allow us to make those tough decisions that we will inevitably need to make in the future? Thanks to the awesome Cundallite Joanne Sim for finding this one. Hi Pip. 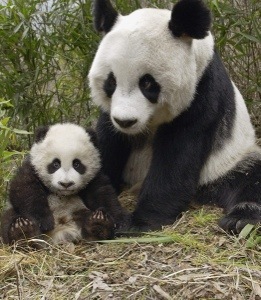 Yeah they are very similar to Pandas. Eat and sleep and thats about it!